Dr. Ravaei is a leading podiatrist experienced in safe bunion treatment and bunion removal for clients in Los Angeles, Beverly Hills, Inglewood, Huntington Beach, Inland Empire, and surrounding areas. 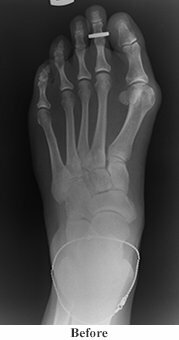 A foot bunion, known medically as hallux abductovalgus, develops when the big toe points toward the second toe, forming a bump on the foot's inside edge. The bump is made of extra bone that the body forms in a defensive mode. The bump is formed because the big toe is not pointing ahead and thus throws off the alignment of the bones. Bunions do not happen overnight, but gradually take shape. The angles of the bones slowly change over the years, producing the bump. Bunions are common, occurring in 30% of the population of Western countries. Researchers in Australia and England have shown that quality of life decreases as a bunion worsens. Bunion pain is associated with overall dissatisfaction across physical, psychological and social domains. Certain flawed structures of the foot associated with bunions are hereditary, however bunions themselves are not. One’s choice of footwear can be a contributing factor. Wearing narrow shoes that crowd the toes can lead to bunions. High heeled shoes place the feet in a pronated position, which can lead to or worsen a bunion. For this reason, it is thought that women have a higher prevalence of bunions than men. Women are 10 times more likely than men to have bunions. According to the National American Orthopaedic Foot and Ankle Society, 88% percent of women in the U.S. wear shoes that are too small and 55% have bunions. Many women with bunions fear wearing open-toe shoes due to the appearance of their feet. At the site of the bunion, the patient may feel pain, a burning sensation, or even numbness. There may be inflammation as well. Bunions are usually visually apparent. However, x-rays are also taken to fully assess the condition. This can determine to what degree the bones are unaligned. Furthermore, bunions are progressive in that they usually worsen over time without the proper treatment. Joint issues can also play a role. Individuals with Rheumatoid Arthritis or other joint problems have a greater likelihood of getting a bunion. Treatment is available with or without surgery. After an initial consultation and a review of the patient’s x-rays, the proper route can be determined. Most non-surgical treatments are early therapies that may reduce pain but will not get rid of the bunion. A bunion’s treatments may include having the patient switch to wider shoes, applying ice to lessen the inflammation, inserting padding in the shoes, avoiding prolonged standing, and other methods that patients can discuss with Dr. Ravaei. There are numerous surgical procedures for fixing bunions, most of which are modifications of each other. Some procedures involve removing the bump. Others correct the problematic areas of the bone structure. In Beverly Hills, bunion removal has come a long way. Foot surgeon Dr. Ravaei utilizes a revolutionary method that enables most patients to bear weight after the procedure. 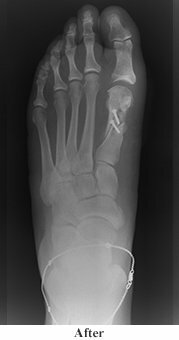 Another benefit of Dr. Ravaei’s procedure is that it gives little or no evidence that the patient has had foot surgery. View the Before and After photos to see this for yourself. To request additional photos, please e-mail us. We would be happy to provide you with them.